I have FINALLY finished piecing the first set of blocks. I still half to square them all up, but I’m saving that until I’ve pieced everything. 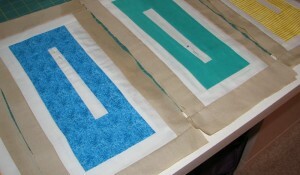 Now I have to piece together the 2nd set of blocks in the other pattern. I’m halfway to laying out this quilt top. I am learning quite a few things while doing this project. A lot of this comes after I’ve made mistakes that I can’t/don’t want to undo, but I will know for next time. My ability to follow directions and a pattern is definitely improving, but I still have a long way to go. A lot of my strips were cut wrong and the measurements were off. So quilt blocks that were supposed to be 17″ x 9″ are actually going to be 17″ x 8″. I have no idea how I did that, other than lots of little mistakes that added up to a whole lost inch. 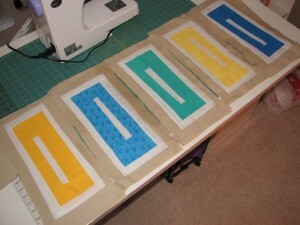 But I made the side pieces extra wide, so I’m hoping that will make up for the difference. Otherwise, this quilt would be 7″ narrower than it should be. That’s almost another whole row of blocks, and I don’t know if I have the mental fortitude at this point to cut out any more pieces for this. I’m also starting to question whether I will actually be able to wrangle this queen size quilt through my sewing machine for the actual quilting (where I sew the top, batting, and bottom together in a flashy carnival of stitchery). That might be more than I’m ready for at this stage of my abilities, so I’m considering saving that last stage for the local quilt shop to do for me. I’ve learned this is very common with quilters, but I feel like maybe I’d be cheating. Does it count as making a quilt if I had someone else do the actual quilting? The blanket in the book was HAND QUILTED. This terrifies me, I’m definitely not ready for that. But I don’t want to mess up all this hard and wonky work by ruining this when it comes time to quilt the whole thing together. Adam says I did all the real work, there’s nothing wrong with letting professionals who have the right equipment do the quilting. He says it’s like a photographer letting a lab develop the prints. I like this thinking, I may have to stick with that story. But overall, I think this is going to look great for Cora and Ian once I actually finish it, however I finish it. I think the colors look great together and it’s funky. I’m proud of my progress so far. I just really hope I finish it by July 4th when they’re here!